How does laser die board cutting machine work ? Laser die board cutting machine is widely used in die board cutting industry. 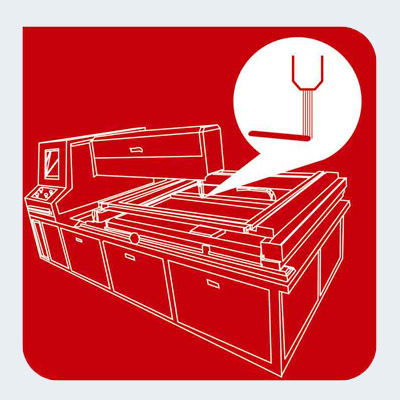 But do you know how the laser die board cutting machine works ? The laser beam of laser die cutting machine is a column of very high intensity light. In the case of a typical CO2 laser, the laser beam is only about 3/4 of an inch in diameter as it travels from the laser resonator, which creates the beam, through the laser die cutting machine’s beam path. It may be bounced in different directions by a number of mirrors, or “beam benders”, before it is finally focused onto the die board. The focused laser beam goes through the bore of a nozzle right before it hits the die board. Also flowing through that nozzle bore is a compressed gas, such as Oxygen or Nitrogen. Focusing the laser beam can be done by a curved mirror, and this takes place in the laser cutting head. The beam has to be precisely focused so that the shape of the focus spot and the density of the energy in that spot are perfectly round and consistent, and centered in the nozzle. By focusing the large beam down to a single pinpoint, the heat density at that spot is extreme. The high power density results in rapid heating, melting and partial or complete vaporizing of the die board material. When cutting die board material, the heat of the laser beam is enough to start a typical “oxy-fuel” burning process, and the laser cutting gas will be pure oxygen. When cutting die board, the laser beam simply melts the material. On a CNC die board laser cutting machine, the laser cutting head is moved over the die board in the shape of the desired part. 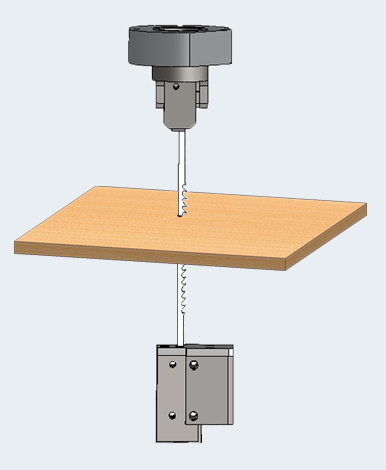 A capacitive height control system maintains a very accurate distance between the end of the nozzle and the die board that is being cut. This distance is important, because it determines where the focal point is relative to the surface of the die board. Cut quality can be affected by raising or lowering the focal point from just above the surface of the die board, at the surface, or just below the surface. As the technology develops, Yisong High Tech successfully released environmentally friendly die board sawing machine, it uses saw blade to cut and adapt numerical control tech to realize full-automatic saw processing way. The processed environmentally friendly die board owns higher cutting precision & accuracy than laser die cutter. Pls check it works on What's the environmentally friendly die board sawing machine different with CNC router and jigsaw machine ?